If you like the idea of staying in a beautifully restored 17th Century townhouse, enjoying gourmet food and walking with a select group (maximum 12) where you can relax and know that everything is taken care of with just the right balance of challenge and relaxation, then our holidays are perfect for you. Our hotel is located in the classic mountain village of Parcent in the beautiful Marina Alta area of the Northern Costa Blanca. It nestles below the stunning Carrascal range just 20 minutes from the coast. With over 30 different mountains to choose from within 20 minutes of Casa Carrascal we can offer a wide range of Guided Walks. We have over 16 years experience in our mountains and so are uniquely placed to lead you safely on over 100 routes. It’s important to have so much choice as over 70% of our guests return time and again! Casa Carrascal operates purely as a Fully Hosted Guided Walking Venue. We specialise in providing exclusive Walking Holidays for a maximum of 12 guests in our beautifully appointed bedrooms and Master Suite. All our guests are like-minded walking enthusiasts with a love for the outdoors and can relax knowing that everything is included in the holiday price. High Quality Gourmet Food is very important to us at Carrascal – using only the freshest seasonal produce. Take a look at photos from our walks and the amazing scenery, flowers and fauna. View our calendar to see what is available and get in touch to book your stay. Look here to see our latest Holidays and then click on more posts to scroll back through the months and years to see what our various seasons look like! 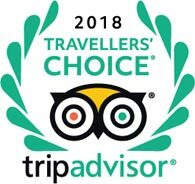 We have over 265 reviews on Tripadvisor and for the 10th consecutive year have achieved their “Award for Excellence” - something only achieved by 1% of businesses worldwide. We are also very proud to be included in Tripadvisor’s Hall of Fame which showcases the “best of the best”.